Origin:	The name is said to have been derived from the Latin bovale (bull's head). Jaume Roig (around 1460) in Espill o llibre de les dones makes mention of this variety in Utiel-Requena. In terms of area under cultivation, this variety is the third most cultivated in Spain. Chief areas of distribution:	The densest concentration of cultivation is in the autonomous region of Valencia in the areas of Albacete, Alicante, Cuenca, and Utiel-Requena. Official synonym(s) (national and OIV):	None. Historic and regional synonyms:	Balau, Balauro, Benicarló, Bobal noir, Bobos, Carignan d’Espagne, Coreana, Espagnol, Folle blanche du Minervois, Provechon, Rageno, Rajeno, Requena, Requenera, Requeno, Terret d’Espagna, Tinto de Requena, Tinto de Zurra, Valenciana and Valenciana Tinto. Homonym(s):	There is a white variety of the same name, which has no genetic relation. Area under cultivation:	85,000 ha (Ministry of Agriculture 2007). Availability of propagating material:	Standard propagating material is available. No certified clone of the variety exists. Recommended in Portugal:	In Valencia. Authorized:	Aragon, Castilla la Mancha, Extremadura (Ribera del Guadiana), Andalusia and Navarre. DOC quality wine:	Alicante, Calatayud, La Mancha, Manchuela, Ribera del Guadiana, Ribera del Júcar, Utiel-Requena and Valencia. Young shoot (form of tip):	Very open. Medium to dense white hairs, slight red anthoncyanin colouration. Young leaf:	Yellowish, very dense hairs on upper side. Young shoot:	At bud burst, green with red stripes at internodes. Nodes green with stripes on ventral side, green on dorsal side, prostrate hairs of medium density. Mature leaf:	Large, predominantly pentagonal, medium sized V-shaped overlapping petiolar sinus. The blade is broad, has rectilinear and convex teeth, with a low length-width ratio. Blistering on upper side of blade. In Autumn, the leaf turns light red. Bunch:	Medium to large, dense. Berry:	Round, medium to large, smooth, blue-black, thick skin, difficult to detach. Flesh colourless, soft, and very juicy. Time of bud burst:	Normal to late. Berry (colour change):	Normal to late. Vigour of shoot growth:	Very high. Shoot attitude (habit):	Semi-erect, with many very long plagiotropic shoots. Tendency to form lateral shoots:	High. Rate of multiple bud bursts:	Medium. Yield:	Yields from high fertility varieties can vary greatly. Sensitivity to abiotic factors:	Very high drought resistance. Susceptibility to fungal diseases:	This variety is known for its high resistance to Peronospora. 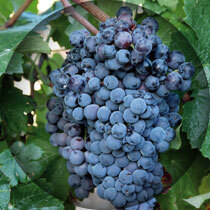 It is less resistant to Oidium and Botrytis. Vineyard conduction system:	Adapts to all training systems. Pruning:	Short pruning required to produce quality wine. Green pruning:	Particularly in fertile soils, foliage requires cutting back in summer. Soil requirement:	Loose and sandy. Climatic requirements:	Adapts well to different climates. Vine density:	1,100 – 1,700 vines/ha. Rootstock:	Risk of coulure with Rupestris du Lot. Spoilage of mature berries:	Minimal. Risk of bird damage:	Low. Hand harvest suitability:	Very well suited. Wine type:	Red wine. Excellent rosé wines are produced in the Requena (Valencia) district, although if yield is limited, high quality red wines, which age well, are also produced. Traditionally, the variety was blended with mass-produced wines of dark colour, or to balance must concentrations. The regional alternative is an interesting Schiller wine made by mixing this variety with grapes from the white Aíren variety. Potential alcohol content:	Low sugar concentration. Alcohol, 11% vol. Natural acidity of must:	5.5 tos 6.5 g/l. Tendency towards acidity loss in fermentation:	Medium. Wine colour tonality:	Dark cherry tone with violet reflexes. 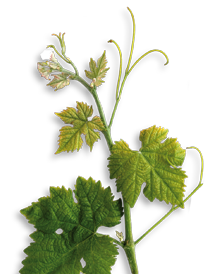 Aromatic profile:	Cabbage tones and fruitiness, high terpenol content. The variety has a remarkably high reverastrol content. Ageing Potential:	Quality clearly improves with ageing. Blending recommendation:	Ideal blending partner for the Monastrell. Wine Descriptors:	The dark cherry to crimson wine with light violet notes begins with the fruitness of dark fruits, added to which there are floral components, but also grassy accents, accompanied in the mouth with a light bitter tone and multilayered tannins. The wine finishes with complex notes. Wine quality:	Under strict yield control, a quality wine with intense colouration.